Review: When an unsuspecting woman (Anne Archer) accidentally witnessed a mob murder a Los Angeles Deputy District Attorney (Gene Hackman) is sent to protect her so she can testify and help take down a major crime figure. This remake of a 1952 film of the same name follows the same initial premise, but here you have the superior acting talents of Gene Hackman, Anne Archer, J.T. Walsh, M. Emmet Walsh, and James Sikking as a coldblooded villain. This chase on a train thriller is tense, clever, and action-packed. I've always been a fan of Gene Hackman and here he does not disappoint. If you're in the mood for a suspense filled, claustrophobic cross-country chase picture, its "All aboard!" for Narrow Margin. Fun Fact: Writer/director Peter Hyams was searching through old movie classics that might be good to remake but only ones which were not too well-known and significant. 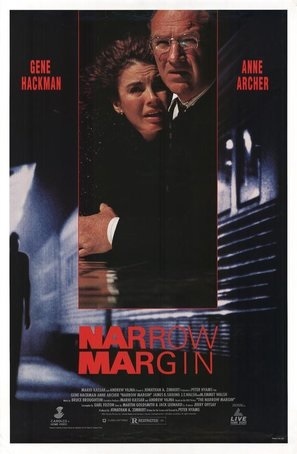 In the end, Hyams chose Richard Fleischer's The Narrow Margin (1952).